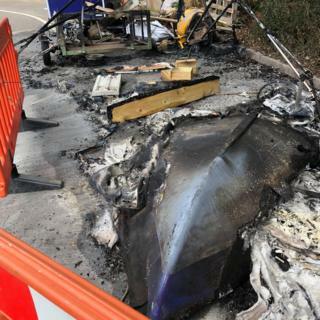 A boat that had been refurbished by a group of young people with learning disabilities has been destroyed in a suspected arson attack. It was donated to Bournemouth-based charity Access Dorset by a local woman after her husband died. The vessel was just days away from going out on the water when it was "burnt to a cinder", the charity said. Dorset Police said it was investigating as it believed the blaze was suspicious. Jonathan Waddington-Jones, chief executive of Access Dorset, said charity members were "gutted" following the blaze in its car park. He said the group of young people, with autism and Asperger syndrome, had spent a year renovating the boat. The work they carried out aimed to develop their skills in a bid to help them with paid and voluntary employment, he added. "They put an awful lot into it - time and emotional energy," he said. "They were really looking forward to seeing the fruits of their labour and seeing the boat put out on the water."